הפוך דמות מסוגננת של דרקון מחזיק את המגן של Llewelyn the Last והמילים "Red Dragon of Wales 1/4 oz Fine Gold 9999 2017"
דמות מסוגננת של דרקון מחזיק את המגן של Llewelyn the Last והמילים "Red Dragon of Wales 1/4 oz Fine Gold 9999 2017"
מטבע זהב Royal Mint חיות המלכה | דרקון האדום של ויילס משנת 2017 משקל רבע אונקיה Order the spectacular 1/4 oz 2017 Red Dragon of Wales gold coin at the lowest price online, third in the Queen's Beasts series issued by Britain's Royal Mint. 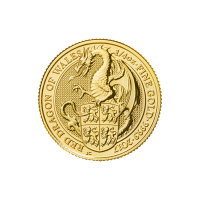 The coin features a dragon, which has symbolized Wales since 829 A.D. Queen Elizabeth II's coronation in 1953 was watched over by 10 heraldic beasts, created to represent the various branches of royal genealogy over the centuries. The dragon represents sovereignty and power, and was first used in the Royal Arms in the 16th century. The shield the dragon is holding displays a lion in each quarter, as on the coat of arms of Llywelyn the Last, the last native Prince of Wales. Unusually, both sides were executed by Jody Clark, an engraver at the Royal Mint. His effigy of the Queen is the only fifth to have graced British coins since 1953.